As Va-Kox and the brainwashed Kal-El and Kara reign terror on Metropolis, Lex Luthor naturally turns to the supervillains for help. But even the team of Bizarro, Parasite, and Metallo are no match for them. 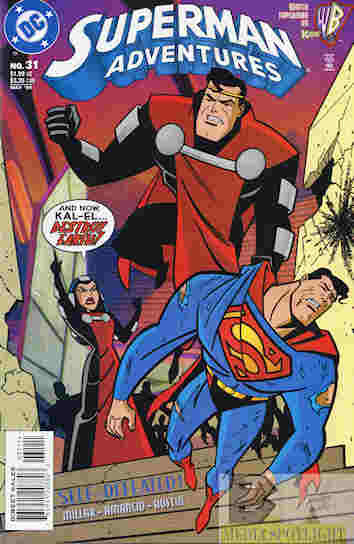 Jor-El manages to get himself and Superman out of the prison and Superman goes to Earth to reach his counterpart when he learns Lara was the one responsible for killing the Kents. The trio managed to overpower Superman, but Jor-El teleports them back to Kryptonopolis, just as he blows the floating space city up, sending Superman back to his home dimension. What they got right: Evil psycho Lara isn’t my cup of tea but she makes for an impressive villain. A city of evil Kryptonians is an interesting idea although DC later would do the same thing in the main universe. What they got wrong: On the one hand, having Kara still immune to Kryptonite (being from Argo City) is in keeping with her last Superman Adventures appearance but is still a continuity error from the DCAU or any other DC universe. And yet that comic featured a version of the Justice League and even the show had other superheroes (the Flash and the Kyle Rayner version of Green Lantern come to mind, plus by this point Batman and his team, and maybe Static at this point; I don’t remember) but this comic acts like only Superman and Supergirl exist. Where are the other heroes during this fight? (Come to think of it, where were they when the regular DCAU Superman was brainwashed by Darkseid at the end of Superman: The Animated Series? Even though there was no DCAU Justice League yet in-continuity there were other heroes.) Or are there no other heroes in this universe? See how confusing the Adventures titles were when trying to connect them to the shows they supposedly tie-in to? Recommendation: A rather good two-parter. Worth checking out. Posted by ShadowWing Tronix on May 5, 2018 in Animation Spotlight, DC Spotlight, Television Spotlight, Yesterday's Comics and tagged DC animated universe, DC Comics, DCAU, Lex Luthor, Metropolis (comics), Supergirl, Superman, The New Batman/Superman Adventures.